The Blythe Hill Tavern has had no shortage of press lately, having been voted Best Pub in London by the Society For The Preservation Of Beers From The Wood (who could frankly do with a catchier title) and its every bit as deserving as the award implies. This Catford gem is famous for its selection of ales, but beloved for its friendly staff: all of whom turn up for work in a shirt and tie. This touch of class is evident throughout the pub, and there are small considerations everywhere. There’s plenty of space to hang up your coat, plenty of racing memorabilia on the wall, and plenty of chat as you wait for your Guinness to settle. Limerick native Con O’Riordan is the patriarch of the Blythe Hill Tavern, and inspires a warm atmosphere enjoyed by ale fans and families alike. Its three bars, big garden and mini adventure playground make it equally as suited to big parties or a quiet evening pint. Hardy’s is so deeply Irish that it doesn’t even have a website. Behind the bar, an A4 piece of paper with “Twitter: @HardysPub” scrawled in biro hangs from a pushpin. Lots of pubs claim to have ‘characters’, but the clientele at Hardy’s are truly novel-worthy. There’s Guinness Steve (who starts off every morning with a cider, to clear his palate), Two Dogs Timmy (guess how many dogs he has?) and Spanner, who everyone is resolutely terrified of. Hardy’s also enjoys an unofficial sisterhood with The Green Pea, the adjoining restaurant run by Tom - or “Mad Tom”, as he introduces himself over the phone. “There’s no such thing as ‘from-a-can’ here” he says proudly, before mentioning his enviable TripAdvisor rating. “I must run my love, the meat is here,” he signs off cordially. Best for: Pies, the chat. When ‘researching’ this piece, there was no pub more highly nominated that then Old Shillelagh. In fact, I’m a bit sick of hearing about it. To many north Londoners it is the Irish pub and it’s not difficult to see why. While it creates all the illusion of being a hole-in-the-wall five-stools-and-one-dart-board establishment from the outside, the inside of the Old Shillelagh is as long and winding as a Kerry road. It’s the only place on Church Street you’re likely to spot a bodhran, and the only place in London that has live traditional music and simultaneously, a David Bowie night every Tuesday. The commitment to Bowie is a thread that runs through the Auld Shillelagh, with its own spot on the menu - fancy a Diamond Hot Dog? Another interesting point about Irish pubs – one theme is never enough. Not satisfied with just being an Irish pub, it’s a Bowie Irish pub. The Churchill Arms (which also made the list) meanwhile, isn’t just an Irish bar – it’s an Irish/Thai/War memorabilia bar. Go figure. Best for: Live music, salt and vinegar Taytos. There’s a lot of argument on the subject of what makes an Irish pub truly Irish. Purists say that it has to stock red lemonade and show GAA matches. Others say that the mark of a true Irish pub is that, as an English person, you feel ever so slightly nervous about going inside. If that is true, then The Churchill Arms fails by name alone. In all other respects though, it’s as Irish as a Daniel O’Donnell calendar. 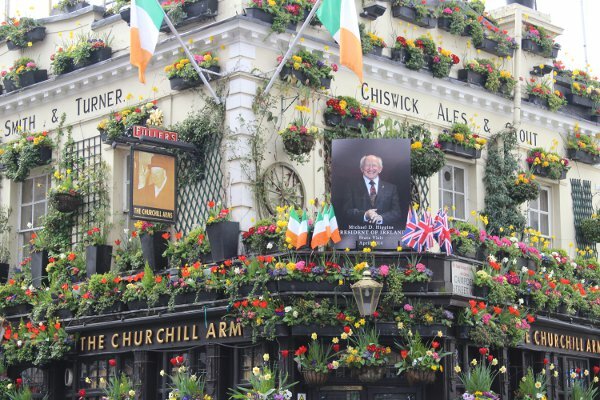 Run by proud paddy Gerry O’Brien, The Churchill Arms is an anomaly: an Irish pub with an English name and a Thai menu. If you haven’t been yet, you’ve almost certainly seen a picture of it. It’s famous for its flower boxes that line the walls and spill out onto the footpath and tumble out of the windows. The Chelsea Flower Show even gave it the ‘London in Bloom’ award two years in a row – and it’s not hard to see why. It’s the Secret Garden meets steerage on the Titanic, and if you’re having trouble imagining what that could possibly look like, then it’s time to pay the Churchill Arms a visit. As the first pub to serve Guinness outside of Ireland, The Tipperary is as steeped in history as it is foamy moustaches. The Tipperary wears its history proudly, and is generally considered to be the Grand Old Dame of the Irish pub circuit. It’s slender and respectable, with an impressive collection of 16 Irish whiskey’s to choose from. Like all Irish pubs, most who love it will admit that it needs “a bit of an upgrade”. But does it? We love Irish pubs because the paint is peeling and the landlord remembers both World Wars – not in spite of it. The Tipperary’s key charm is its location: in a part of London so sleek and corporate, it really feels like a blessing to have a proper old man pub in the heart of it. And no one’s impressed by your American Express black card. This Tooting jewel is alternately called a hole or a heaven, depending on who rambles in. It has its own weekly poker night, an acoustic evening (whose reoccurring stars include Rambling Lee, Great Phil Philpot and the Fantastic Smiling Knife) and all the hurling you can shake a stick at – so who’s complaining? One customer describes The Ramble Inn as the last stand in the “Tooting yuppies invasion”, and there’s certainly nothing yuppieish about this traditional Irish boozer. Like all great Irish pubs, it’s a hive of activity around all the big sporting events, and shows everything from GAA to horse racing to hurling. Make sure to turn up early though if you want to claim a seat during the big matches. It’s also weirdly proud of the fact that it cleans its beer lines every week, if that means anything to you. Best for: Sport, avoiding yuppies. Even if you love your Irish pubs as rough as a badger’s arse, there is something nice about having a few frills on the drinking experience. Now that we’re six pubs down, it’s time to treat ourselves. And where’s more frills-on then the heart of West London? 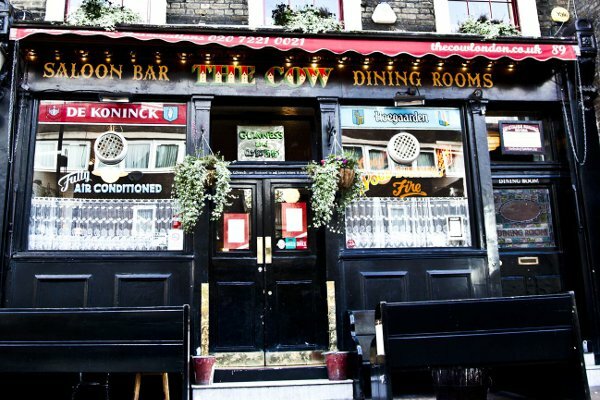 The Cow is a gastropub to the very last, and not in the way that every other pub in London has commandeered the term. Here, “gastropub” doesn’t just mean throwing a few tiny burgers onto a bread board. Gastro means crab meat, fish stew with rouille and plenty of croutons, with just a scattering of chilli flakes. Wood pigeon sits stoically beside bangers & mash on the menu, giving you a fully rounded and very posh Irish eating experience. The décor here is naturally a bit more upscale then the pictures of toucans you might get elsewhere – tasteful illustrations of cows adorn the walls, and there’s a touch of refinery in everything, despite staying quintessentially Irish. A traditional Irish pub with a student ‘ring’ to it (see what I did there?) the Claddagh Ring has a great mix of live music, sport, and killer nights out. Established in 1991, the Ring is distinctive for its intricately carved wooden structures, sleek marble décor & warm ambiance. There’s not too many places you can get a lamb stew and a dance on, but Claddagh Ring serves both with enthusiasm. It’s also known for taking care of its regulars, while simultaneously providing a warm atmosphere for everyone who crosses its doors. If you lived in London any time between 1960 and 1999, Kilburn means one word to you: Irish. Irish, Irish, Irish. People have similarly touching and troubling stories about Kilburn over the years, with one youngish customer of the Colin Campbell cheerily reporting that their parents used to pay “safety money” to the IRA in order to continue living in Kilburn. These days though, Kilburn is more students and rock bars then traditional Irish pubbery, but the Sir Colin Campbell is still keeping it real. Ruled with an iron fist by the landlady Mary (“woe betide you if you cross her”) its usual customers tend to be over 60 and teetering joyfully on their stools. The décor is lovingly outdated, and don’t let the drawn curtains fool you – it can actually be very welcoming. And even better – has mega cheap pints. Looking for tips? The Royal Exchange might look like a quiet corner pub, but in reality it’s a hub of activity for anyone who’s interested in the racing industry. Sometimes it feels like there are more four-legged patrons then there are two, with thoroughbreds adorning the many flatscreens on the wall along with the artwork scattered around the Royal Exchange. It’s not just horses that are number one here: the place is also famous for its salt beef sandwiches and steak pie, so don’t hold your breath for a vegetarian menu option. Like many Irish pubs, it’s celebrated for being a traditionalist hub in the middle of a cosmopolitan city, and certainly defies its slick surroundings. Despite the racing vibe seeming a little intimidating at first, the staff are incredibly cheery and welcoming to those who don’t know their stallions from their geldings. A complete maze of floors and stairs, The Porterhouse feels like a bit of a labyrinth of drunken memories on first entry. Once you’ve safely located your table, the bar, and the nearest bathroom however the fun can really begin. With plenty of beer choice, outdoor heated seating (always a plus in the middle of the city) and live music, The Porterhouse is has everything you need. It’s a sprawling, endless spin of fun that always ends in a night full of stories and a pocket full of crisps. It also does a relatively cheap Sunday roast for central London, making it the ultimate tipsy-day-to-wild-night pub: certainly not what you’d generally expect from the shopping-centric Covent Garden. While the music does invite dancing, there’s plenty of cosy nooks and crannies to have a chat in – or to make a play for your office crush in privacy, if you prefer. Best for: After work drinks, a bit of a dance. 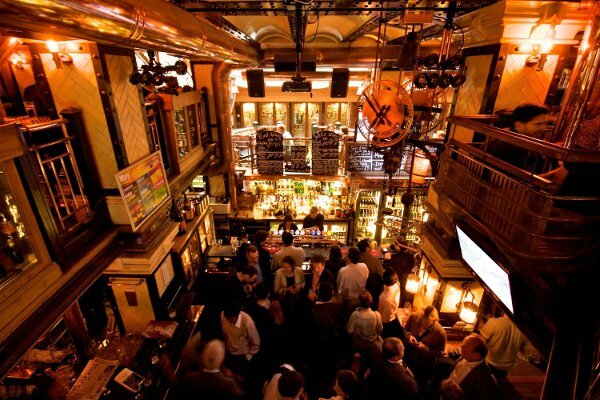 Did we miss your favourite Irish pub? 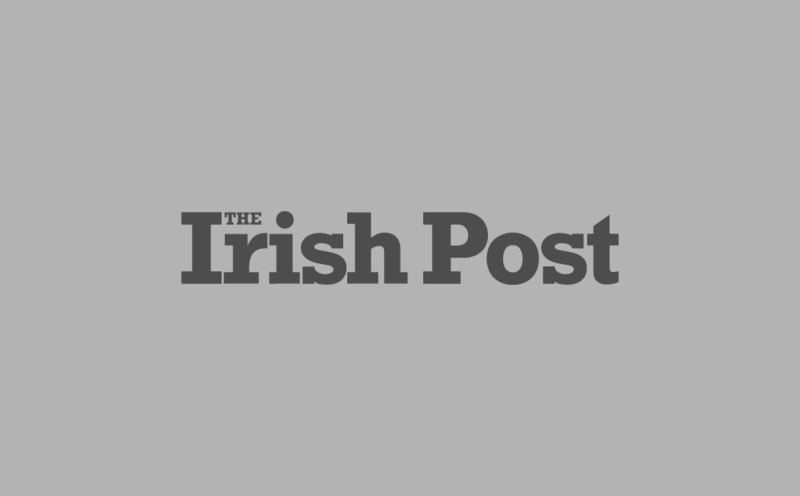 Let us know, or tweet @irishpost with your suggestions.